How many of you ate Chex party mix as a kid? I did. When my parents had friends over — for pool parties or poker games — they always put out a big bowl of the stuff. Several kinds of Chex cereals, cashews or peanuts, pretzels, maybe some of those goldfish crackers, all mixed together with butter and soy sauce. Say what you want about how abominable the stuff really was, but it was addictive. I constantly wandered into the living room to steal handfuls before heading back to the bedroom to read comic books with my brother. I must admit — I hadn't thought about Chex mix for years, or particularly missed it. After I went gluten-free, there was no chance of something with Wheat Chex in it. 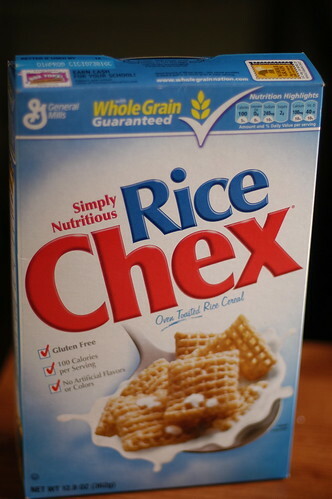 But earlier this year, when I read that Rice Chex had gone gluten-free, I grabbed a big box at the supermarket. How could I not? This is one of the biggest mainstream companies to go gluten-free, and to do so with a flourish. The outside of the box pronounces, with a red check: gluten-free! This alone makes me happy. And heck, the Chex website has a page of gluten-free recipes for this sturdy cereal. Here's the thing. This isn't my favorite cereal in the world. It feels healthy and the same as always. And I'm probably not going to be making Muddy Buddies any time soon. But this is big. When you start to see yourself portrayed in the mainstream, you feel more accepted. Rice Chex has always been a favorite of mine and my children... so being GF is AWESOME. I'm glad they have left the barley malt behind. I still am unlikely to give it to the kids because of the BHT used... but I might indulge every now and then! Now that you are about to become a Mommy, you will start to appreciate fun things like those fruiti sushi's... what a great GF party treat, especially if you make them with FruitaBu Fruit Twirls instead of junky fruit roll ups! I made muddie buddies the other day....YUMMY!!!! I used to just use Health Valley's Rice Crunch Ems' but now I can use Rice Chex!! WOOHOO! I can't buy Rice Chex anymore because I bought them a few weeks ago. They were so good I was eating bowls of cereal all day. the fact that a low whoosh of breath in the form of "ooohhhhh" escaped my lips when i read this post says it all. i miss crunchy cereal so this is like manna from heaven. shauna, thanks so much for this new blog. and we're all excited to meet Little Bean when the time is right for you and the chef. good luck to you on this new journey!! I am just so happy that I can finally buy a GF cereal almost anywhere! Why didn't I know about this blog earlier?? I just discovered that Rice Chex are GF as well! There's a recipe for fruity trail mix on the side of the box that I'm gonna try too. Thank you for this! I'm glad you mentioned Rice Chex. They are also corn free. Thanks to this blog I just discovered (or rediscovered) rice chex. Glad to have a regular cereal I can eat. While I was at the store I saw that their corn chex is also gluten free. Neither one has any dairy or soy ingredients either. Way to go General Mills!